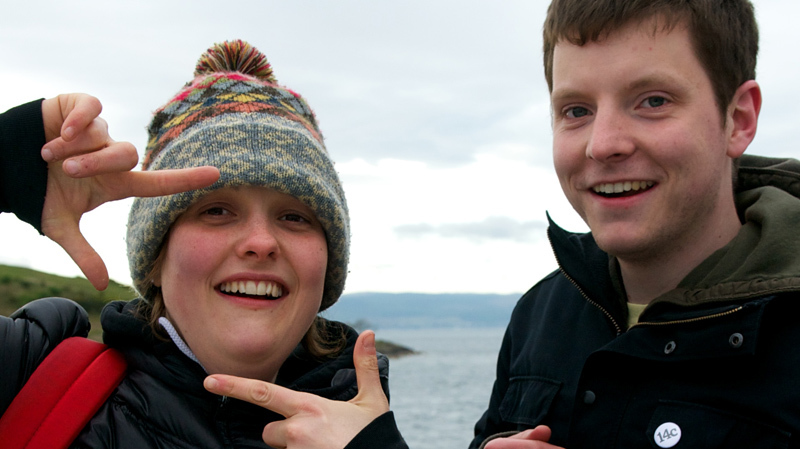 Douglas and Josie Long wrote a short film in the children’s section of the Mitchell Library in March, six weeks later we were shooting our biggest production yet. And what a shoot it was. We had BBC Radio Scotland’s Comedy Cafe show visit on our first day in the fantastic Biblocafe on Woodland’s Road – luckily for us Josie did most of the talking. The shoot was over 5 days and took us from King Tut’s to sunny Largs. We had some fantastic luck with securing a brilliant crew, equipment hire and most excting of all – catering courtesy of Austin Yuill from his Where the Monkey Sleeps in Skypark, Finnieston. Darren is still addicted to chocolate custard pots. Stuart Murdoch and Aidan Moffat provided hilarious cameos and we were all a bit blown away by their turning up. Post production is now underway and we hope to have the film winging its way round the international festival circuit this year.